It’s that time of the year again, when we take a look at what’s in store for mortgage rates the following year. So without further ado, here is the “2018 mortgage rate forecast” from a variety of different housing and mortgage groups. Note that these forecasts generally apply to conventional loans backed by Fannie Mae and Freddie Mac. Typically, rates are slightly lower on FHA loans. Now that we’re about halfway through the year, I figured I’d check in to see which forecast is most on point. It appears that with the 30-year fixed averaging close to 4.625% and 4.75% as of early August, the estimates from the Mortgage Bankers Association and National Association of Realtors are the most accurate. 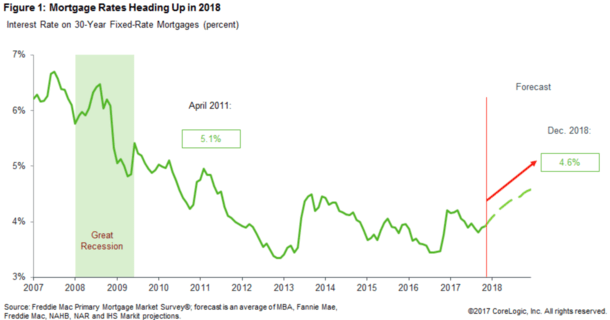 The MBA predicted a rate of 4.7% by the third quarter of 2018 and they’ve basically nailed it on the head, which is somewhat unwelcome news for the prospective homeowners and existing borrowers looking to refinance their home loans. The NAR expected a rate around 4.6%, which is also pretty close to what’s being offered by mortgage lenders these days. Fannie Mae’s prediction of 4.1% is the worst of the bunch, and while brother Freddie Mac is a bit closer at 4.4%, they’re still off by a sizable margin. Of course, if you take the time to shop around, there are still plenty of bargains to be had, and some lenders are still offering 30-year fixed rates closer to 4.25% and 4.375%. However, these lower rates may require that you pay discount points at closing. So be sure to pay attention to closing costs when shopping rates! 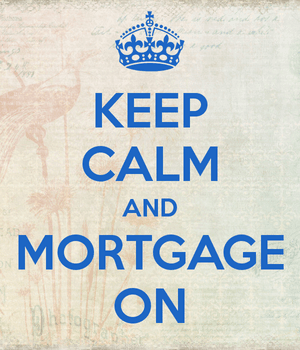 We’ll start with the Mortgage Bankers Association, which releases a monthly Mortgage Finance Forecast. In their latest release, they predict where 30-year fixed mortgage rates will go next year and even in 2019 and 2020. All in all, it doesn’t look so bad, though a slow creep from the current ~4% rate to the high-4s could dent some wallets pretty good. And in 2019, they see rates rising to 4.9%, just shy of that all-too-scary 5% threshold. Don’t ask what they think will happen in 2020. Fine, I’ll tell you, we’re looking at a rate of 5.3%. Yikes! It’ll be interesting to see how the housing market reacts to these potential rate hikes, with home sales already sluggish at current levels, and home prices pretty high. While the MBA’s estimate certainly didn’t put us at ease, maybe Fannie Mae’s forecast will be a little rosier. Let’s find out. That’s more like it! You gotta love Fannie Mae – they never seem to get too worked up when making their mortgage rate predictions, and 2018 is no different. In fact, they barely expect mortgage rates to budge next year, with perhaps only a quarter-percent rise throughout the year. Amazingly, their forecast for 2018 is lower than their 2017 predictions, which had called for rates as high as 4.3%. In 2019, they’re still playing it cool with relatively flat rates and only a slight rise to 4.3% by that December. For the record, they’ve nailed it two years in a row, so they might be the horse to go with in 2018 as well. If they’re right again, it’ll be more good news for both prospective and existing homeowners. 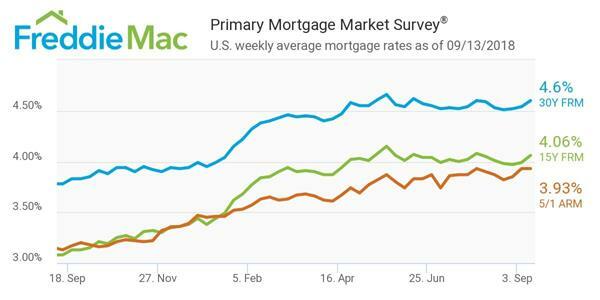 Now let’s take a look at brother Freddie Mac’s forecast, which you might want to pay close attention to seeing that they release the bellwether mortgage rate survey every week. Okay Freddie Mac, we can deal with that. A mere 10-basis point climb in the first quarter, followed by similarly reasonable increases in subsequent quarters. Yeah, that probably works for most folks. A 4.6% rate at the end of 2018 certainly isn’t something to get upset about. As for 2019, you’re looking at a still decent 4.7% 30-year fixed rate. Then there’s the National Association of Realtors, a group that always seems to fear for the worst when it comes to a market forecast. I don’t think they’ve ever predicted things to just remain where they are. They seem to sell urgency, which is important when you’re trying to get people into homes. The NAR National Housing Forecast actually calls for an average rate of 4.2% in the beginning of the year, with rates reaching 5.0% by the end of the 2018. If you whip out a mortgage calculator you probably won’t be thrilled with the monthly payment increase at 5%, though it does depend on the loan amount. And it might not even happen. Last year, they expected the 30-year fixed to climb to 4.6% by the end of 2017, which as you may know, didn’t transpire. They seem to make some comparatively loose predictions, often going with whatever the next highest threshold is in terms of rate changes, though they’ve backed away from their near-5% estimate held in 2016. My point is it seems more psychological than it is scientific, and perhaps that’s a good thing if you want rates to stay in the 4% realm. We’ve also got a prediction from Zillow, which recently surveyed some 100 housing experts, market strategists, and economists about mortgage rates in 2018 (among other things). That survey’s median prediction is 4.50% on the 30-year fixed, with a low-end prediction (25th percentile) of 4.28% and a high-end prediction (75th percentile) of 4.70%. Depending on who’s right, if anyone, rates could move as little as a quarter of a percent to nearly a point higher next year. I also stumbled upon the National Association of Home Builders (NAHB) interest rate forecast, which sees the 30-year fixed rising to 4.20% next year and 4.67% in 2019. The chart below from CoreLogic is an average of all those forecasts, which points to a rate of 4.6% by December 2018. The more pessimistic MBA forecast might be pushing it higher. In summary, 2018 is looking like it’ll go relatively easy on mortgage rates, assuming the consensus is correct. Of course, anything can happen and the general trend seems to be higher price forecasts rather than lower. But if any rate movement remains muted, it should help buyers contend with rising home prices, and also keep mortgage refinancing incentives alive for those looking to save on their existing mortgages. If rates really jump, I expect more borrowers to look at adjustable rate mortgages, or to consider a home equity loan as opposed to a cash out refinance. It could also put pressure on home sales and the housing market as a whole.